What happens to the stuff you leave behind when you die? Most of us do our best to avoid thinking about the uncomfortable transition our loved ones will face after we’re gone. This difficult time is the context for the Bank of America Empathy package. When someone dies, banks are notified by the Social Security Administration that one of their accounts is tied to the social security number of a recently deceased person. This alerts the bank to begin working with executors and heirs on the long and complicated legal process of closing or transferring accounts. 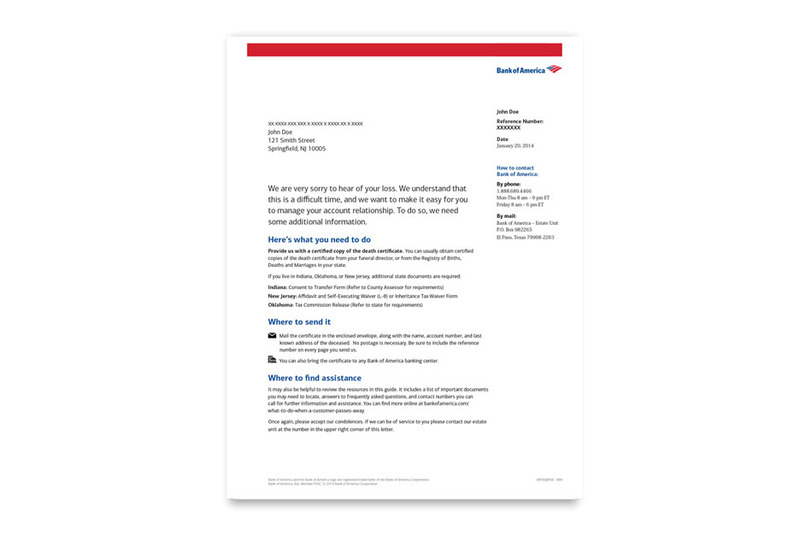 The Empathy package is the first touchpoint during communication between Bank of America and the decedent’s representatives. Addison was hired to curate the information to be included, and write and design the component parts. The package received very favorable responses during focus group testing; feedback indicates that clients viewed the package as a compassionate gesture of support during a difficult time. It was launched in April 2015.